I really love the structure of my reading and math tubs this year. If you want to find out about reading and math tubs, you can read my previous posts. I've never been super confortable with giving my children choices during independent work times. I guess that's the control freak in me. I like the control of grouping my children (either by ability or behavior). But, I decided to give "choice" a try as we come to the end of the year. I have a pretty good class this year, and I thought they could handle it. I first started by adding student choice to Math Tub time. We do math before reading each day, so it just made sense. I told my kiddos if they could make good choices all week with math, we would give reading a try the following week. I've been really pleased with their choice-making abilities. Granted it's not as quiet as when I was picking the groups, but I think it adds a little more enthusiasm for the activities. Well, I have 18 kids and 4 tubs each week (4 reading and 4 math). At the beginning of our tub time, I let the children come up one at a time and make their choice on the Promethean Board. They know that only four children can pick each tub- then that tub is full. The two children picked to make their choice last get to be the fifth child at two of the tubs (so there are 2 groups of 4 and 2 groups of 5). Here's what my flipchart looks like. 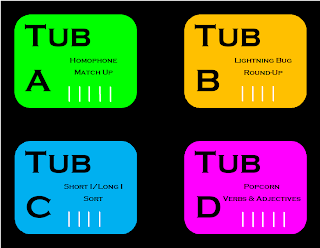 I just quickly change out the names of the tubs each week, to help the kids know where they want to go. As they are making their choices, I also write it down on a little chart. I probably don't have to do this part, because they remember what has already been completed. But, I like to see what's been completed by the end of the week. Maybe I'm trying to keep a little control?? After they make their choice they go ahead and get started. This has helped space out the kids getting started, so they all aren't moving at the same time. How do you do choice in your classroom? If you are searching for a math tutor for your child, you should know how important it is for your child to understand math. No matter what grade your child is in, there is math help for him or her. Unlike the past, you do not have to go to the arcades to play different games. In case of Tower Defence games as well, as these activities are available on the internet, you can enjoy them anytime you want. Online games have in fact provided as hassle free of entertainment for gaming freaks. They do not even need to buy different gaming consoles as the internet has all sorts of activities available for them all the time. Also, as most of the online games are free, it saves a lot of the gamers who can now indulge in the entertainment of their liking for free. Tower Defence games are also available for free. You can just get online and look for a TD game of your choice. A few clicks are all that it takes and you will be exposed to the activity which you love to play. This work is done very qualitatively and I liked custom essay writing the fact that I can use some of your ideas.